Grace Kids: During the Sunday services for all children aged 1 to grade 6. Visit the Grace Kids registration desk on arrival. Find out more about Grace Kids below. For more info contact isabel@grace.org.za. what's coming up at grace? To listen to sermons from our Ballito Campus, click the button below. Got Zapper? Scan the code to the right if you would like to bring your tithe, or give an offering to Grace Family Church, Ballito via Zapper. At Grace you can get involved in serving others at the campus you attend. Our vision is to grow the hearts of people to serve God, by joining together a team of volunteers that will make a difference to the larger community. FIRST, know where your spiritual gifting lies. Take the online Spiritual Gifts Assessment to give you a clearer understanding of where best you could serve at Grace. You can complete the Spiritual Gifts Assessment HERE after which Ruellé Callaghan, our Volunteer coordinator, will be in contact with you regarding your results and where you can get involved. OR, check out the serving opportunities available at your campus on our 'Serve' page - CLICK HERE - and get in touch the relevant ministry leader to apply. For more info on serving at Grace contact Ruellé on ruelle@grace.org.za. 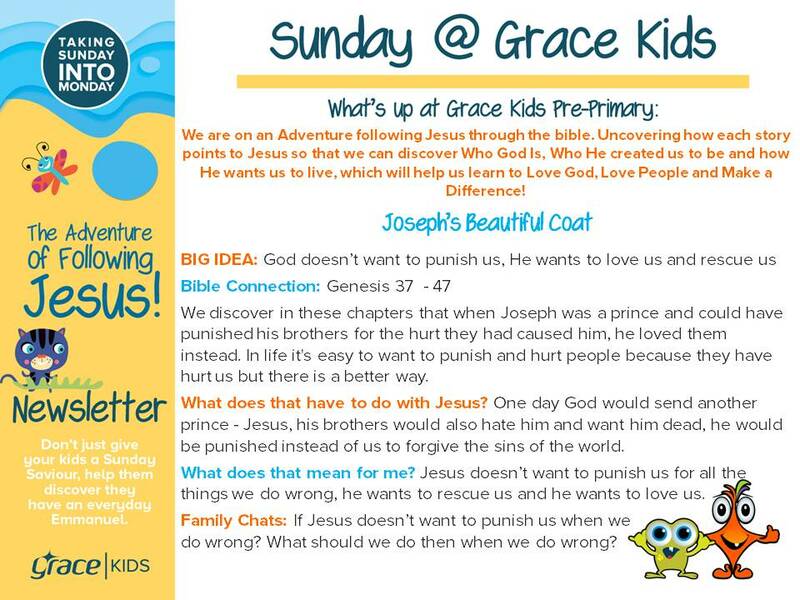 Grace Kids is a fun, safe place for kids to discover THE ADVENTURE OF FOLLOWING JESUS. We use creative, relevant, and age-appropriate Bible teaching, high-energy worship, and dedicated small group leaders to ensure kids enjoy their hour on a Sunday. At Grace we understand that there is more to leading children to Jesus than just Sundays. That's why we intentionally partner with parents and families to help kids discover and develop a meaningful relationship with Jesus. Grace Kids runs every Sunday during our 08:15 & 10:00 services. All children are signed in and out of Grace Kids on a Sunday by their parents and are allocated a unique number. In the event that a parent needs to be contacted during a service, your child's number will appear on the screen in the main auditorium. For parents of infants 0-12 months, our auditorium is equipped with a Parents Room with a glass window so parents can see and hear the service. Otherwise, check out what's available for every age up to Grade 6. This facility is staffed by dedicated volunteers, who will care for your little one with their safety being our priority. Our primary school children get together for high-energy, action-packed worship and creative, relevant teaching time. This is followed by age-appropriate small group time that reinforces the lesson led by our amazing Grace Kids volunteers. Parents can sign up for a weekly email that explains the lesson and gives ideas for related family discussions, email Isabel on the address below. 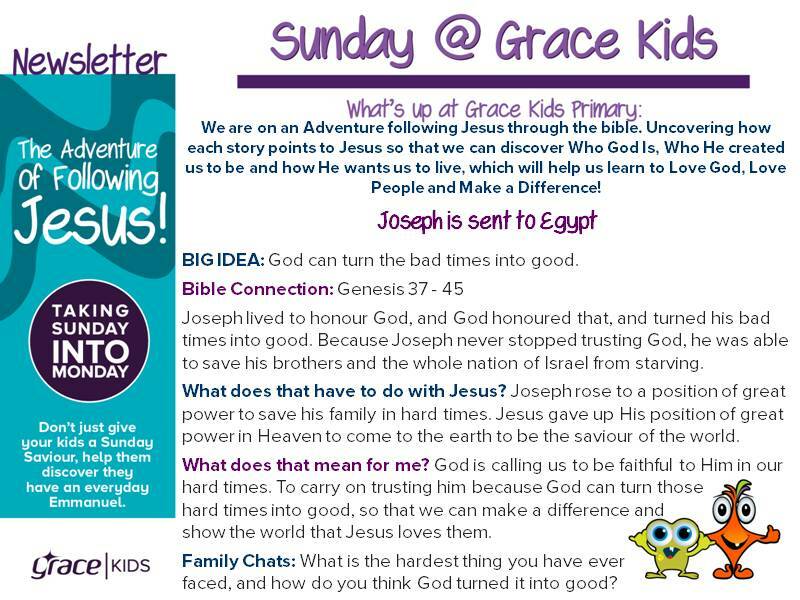 To download this week's Grace Kids Newsletter for Pre-Primary kids CLICK HERE. To download the Primary kids newsletter CLICK HERE. If you have any questions about Grace Kids Ballito contact our Grace Kids Pastor Isabel Braz isabel@grace.org.za.